April: Welcome to #1 Fabric Co., your source for first quality, discounted designer fabrics and wallcoverings. Today, we want to introduce you to some of our Fabricut Fabrics specialty collections and designers, which are all available for purchase through us, #1 Fabric Co.
No doubt, you’ve heard of world-renowned designer, Nate Berkus. Nate’s design philosophy is to decorate with the things that represent you as a person, things that bring you happiness, so that you can express yourself to others through your home. In the fabric collections he has designed for Fabricut Fabrics, you will discover patterns, textures and colors all purposed to layer and complement one another. Nate has also turned to travel, fashion, film and antiquities to find inspiration for his Fabricut collection. If, like Nate Berkus, you believe your home’s design should represent your cumulative experiences in life, create your timeless interior design autobiography using Fabricut’s Nake Berkus collection. To place an order or to get a quote for any fabrics from this collection for your project, give us a call or send us an email. We would love to help you with discount pricing on these designer fabrics! So, Jen, who else can we expect to find offered through Fabricut Fabrics? Jen: Well, Lillian August, whose name is synonymous with home fashion, also has collaborated with Fabricut to create traditional collections as well as a more uptown-take on traditional, her “Townhouse Collection.” This collection is inspired by documents and archives from Lillian’s personal collection and her knack for color and design. For example, her namesake pattern, Lillian, was inspired by an 18th Century document and updated to achieve a new traditional, townhouse look. 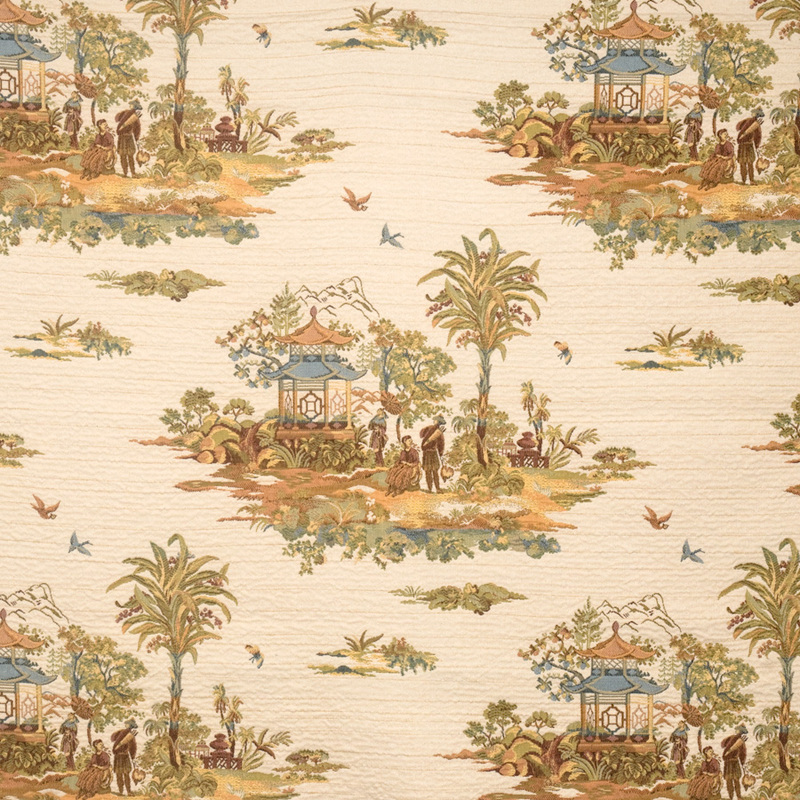 And the Fabricut Fabrics Tea Ceremony pattern is Lillian’s fresh take on a traditional Asian toile. There is an extra wash step on this unique tapestry, creating a soft hand on this fabric pattern. You will find Lillian August’s designs to range from lyrical prints to romantic landscapes, and to include classic silks, luxurious velvets, graceful damasks and beautiful jacquards. To use Lillian August as an application for your next upholstery or drapery project, give us a call or send us an email. We would be delighted to hear from you! April: That’s right! And this is just a sample of the designers offered by Fabricut. Not to be missed are collections by Isabelle de Borchgrave – a world-renowned Belgian artist and sculptor known for her colorful and intricate paper creations, there is Charlotte Moss, Collier/Campbell, as well as brands like French General and even a collection inspired by the home of our first President – George Washington’s Mount Vernon collection. Another collection inspired by a historical estate is the Ritz Paris Fabric Collection, with fabrics based on the authentic décor of the Ritz Paris Hotel that opened back in 1898, also offered by Fabricut Fabrics and available for purchase through us. So give us a call to get started on your next design project! For more information on our Fabricut Discount Fabrics and Wallcoverings give us a call today at 877-322-2968. Be sure to to visit our online discount fabric and wallcovering catalog to view our entire product line of Fabricut Fabrics patterns.